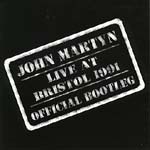 Live in Bristol is an "Official Bootleg" released in conjunction with the John Martyn fan club. It is released in a special numbered limited edition of 5,000. Featuring popular Martyn tracks, 'Big Muff' (co-written with Lee Perry), 'Couldn't Love You More', 'Sweet Little Mystery', 'John Wayne' and the seamless Jazz flavoured 'Cooltide', the title track of that year's album which was released on Permanent.